The recent deployment of “Tag Suggestions” on Facebook has been a hot topic of discussion for activists seeking more privacy controls. The Facebook feature is currently turned on for all users and uses facial recognition patterns to help users tag friends in photos. The software compares newly uploaded photos to previously tagged photos to search for a facial match. 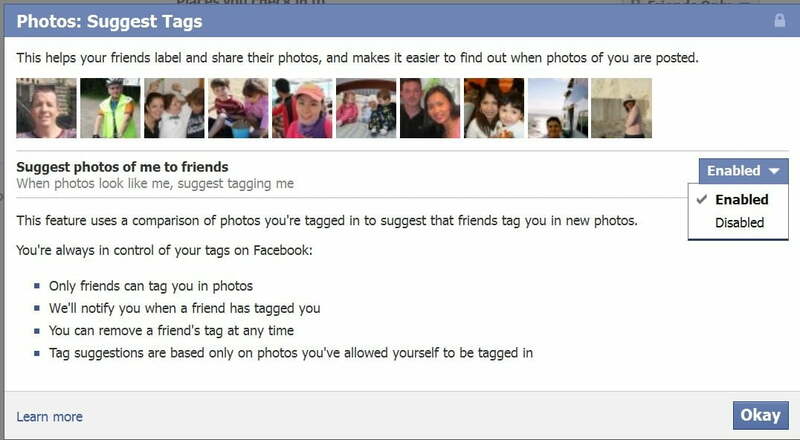 Users can easily opt out of allowing their face to by tagged in friend photos, but only a small portion of users are likely aware of the automatic tagging function. After Connecticut Atty. General George Jepsen made his concerns over the privacy of this technology public, Facebook launched an advertising campaign on Facebook to teach users about the software and direct users on how to turn the feature off through the security settings on a user profile. In addition, all facial recognition data is deleted once a user decides to opt out of the program. This pop-up advertisement has appeared over 2.7 billion times on user profiles since the first ad ran on July 1. Another round of advertisements began today and every U.S. visitor should see the advertisement twice. However, the automatic tagging feature has been turned on for all U.S. Facebook users since late 2010. Photo tagging features in services like iPhoto require user authorization before allowing facial recognition. Facebook’s approach is opposite of that which has led privacy groups to complain to the US Federal Trade Commission over Facebook’s release strategy. However, Facebook has made other advances in rolling out tools for users to remove unverified accounts from impostors. They claim to have sped up response time, improved the reporting system and setup an account freezing tool to get authorization. Ideally, this will make fake accounts more difficult to keep open and discourage people from impersonating others.